The Caro Kann Defence is called the defense of the world champions as it was often played in historie by the world chess champions of the past and is considered as a very solid chess opening for Black. This is a solid system played often by Vasily Smyslov and Anatoly Karpov. The idea is playing the kingside knight to f6 (Ngf6) and to attack the white knight at e4. If White exchanges knights then the black knight at d7 recaptures. This avoids damaging the pawn structure which would occur if Black plays the kingside knight to f6 right away, without playing Nd7 first. 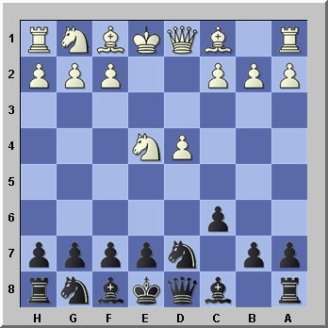 In this case White would capture the knight and create double pawns as Black has to recapture with a pawn. But White can prepare a knight sacrifice on f7 or e6, playing 5. Ng5 followed by Bd3, Nf3 and Qe2. This has to be kept in mind if you play this variation with Black. Be prepared and nothing will happen as this is still a solid opening for Black. Unfortunately Kasparov lost his last game and the match with this variation against the computer Deep Blue 1997, playing the black pieces. Deep Blue sacrificed his knight on e6 and won the match. However Black can play better and avoid this sacrifice and achieve a solid game. The advantage is that you avoid that your bishop gets chased around, which would happen when you play 4...Bf5 instead. (ex: 4...Bf5 5.Ng3 Bg6 6.h4) The Smyslov Karpov variation gives Black the freedom to play his bishop somewhere else later on and not necessarily to f5 where it can be chased by the white moves Ng3, h4 and h5.